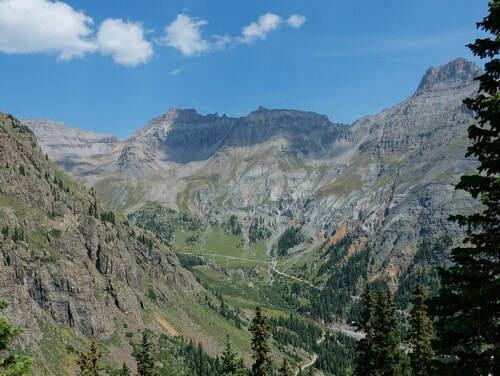 ​The drive to Yankee Boy Basin from Ouray is spectacular. It is very popular with tour companies and tourists alike, so be prepared for a lot of traffic until you get to the very last part of the trail. Most of the Jeep trail is rated 2.0 and this is the most heavily used. The last section that climbs up into the basin is rated 2.5 and is by far the best part of the trip. 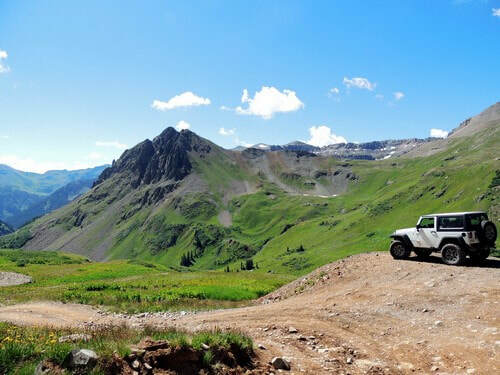 The difficulty discourages many people unaccustomed to driving off-road. ​There is a GPS - gpx track file at the bottom of the page. There is an overhang where the road is cut into solid ledge. ​This photo was taken from Governor Basin, and shows the upper end of the GP rated Yankee Boy road beyond the overhang. Mt Sneffels, a 14er, is in the upper right. Look closely and you can see the falls on Sneffels Creek in the middle of the photo. They are worth a short walk. Please note that heavy rains can wash out or clog this road at any time, making the 2.0 rating iffy until the road is repaired. 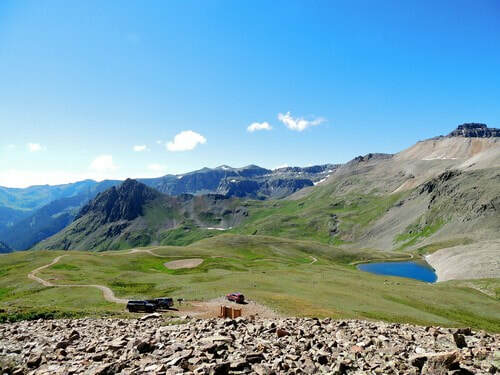 ​The Ouray Silver Mine, on your way up the basin, is a successor to the Revenue Mine. 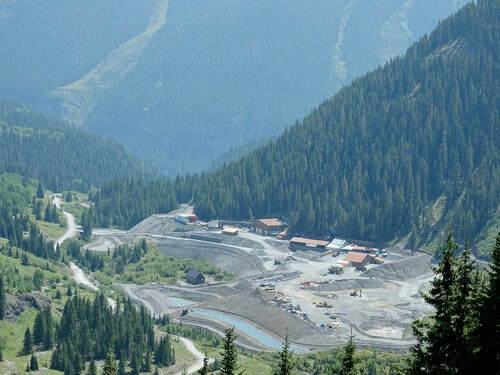 The mine redevelopment began in 2011 and was continuing when we visited in 2018. A newspaper article details the history of the mine up until 2013, and another updates it until 2017. 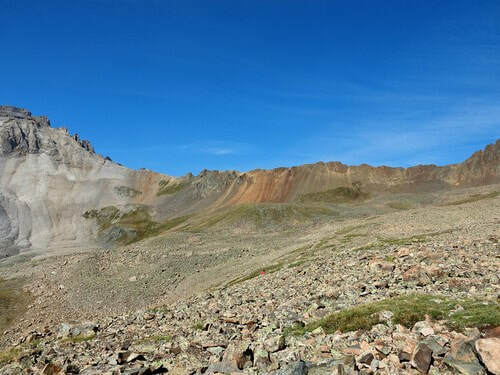 It is connected to the Virginius Mine in Governor Basin, 1,500' higher in elevation. 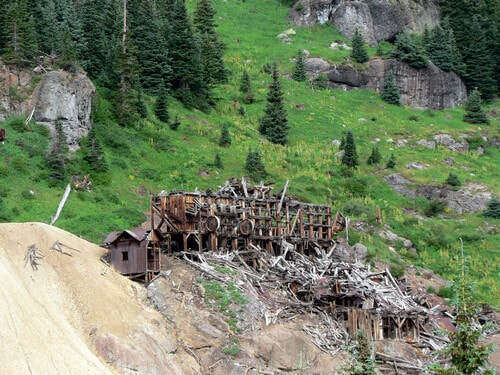 Shortly after the Ouray Silver Mine are the Remains of the Atlas MIll. 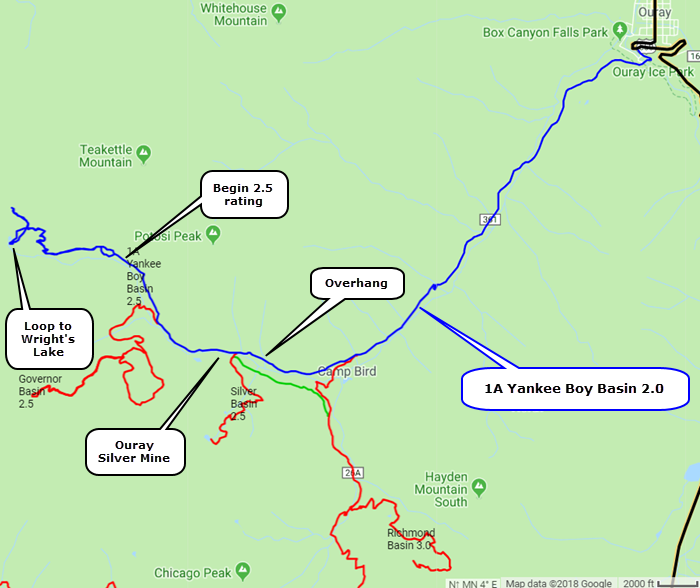 This website features an Atlas Mine Hike that will take you to the mine that supplied this mill. 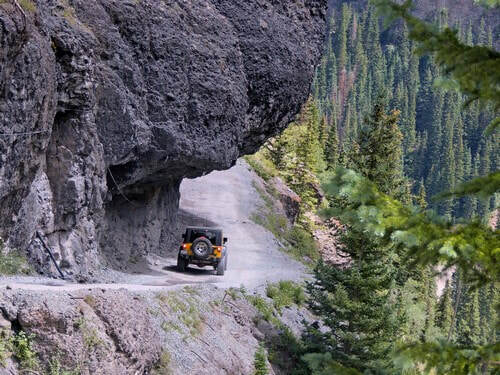 The road into the upper part of the basin has several obstacles rated a strong 2.5, and these discourage many people not accustomed to driving off-road. The road ends just beyond the hiking trailhead at 12,500'. Pica and ptarmigan are frequently seen in this rock field. Be sure to drive the loop road down to Wright's Lake on your way out. 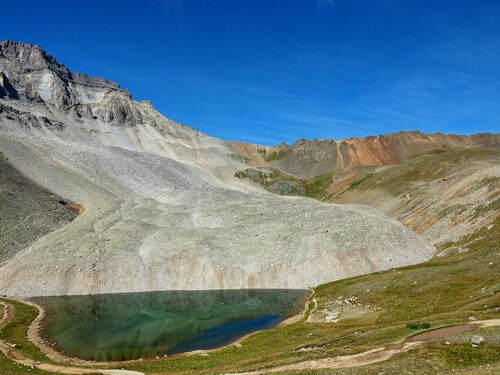 There is a hiking trail over Blue Lake Pass at the very top of the basin. This trail continues to Blue Lakes, then on a road featured in Ridgeway INs and Outs 2.0 outside Ridgway. 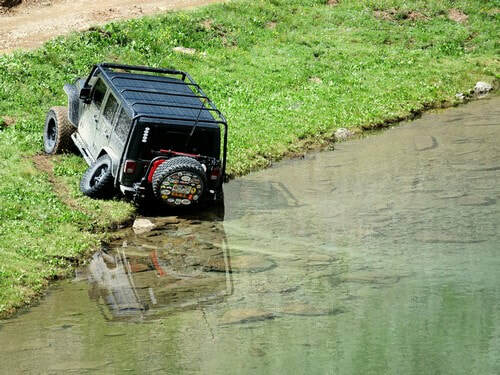 We discovered this Jeep in Wright's Lake in 2017. It appears the driver backed into the lake for a photo then broke when attempting to get out. We gave this photo to the Sheriff but do not know the outcome. The damage seems to be fitting punishment for such foolish behavior.